Heating and cooling costs account for nearly one-half of the average residential electric bill. When the weather is frigid, most of the heat generated by your furnace or heat pump rises directly to the attic, where it dissipates through the roof. In warm weather, many types of roofing material can pull solar heat into interior spaces, making your air conditioning equipment work harder and use more energy. If you are planning to reroof your house, consider energy efficient roofing products. Two main factors determine the material’s ability to enhance rather than detract from ambient indoor temperatures: thermal emittance and solar reflective index. 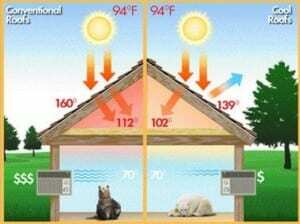 Thermal emittance is the quantity of absorbed heat from sunlight given off by a roofing material. The higher a product’s thermal emittance, the more warmth it releases into the outdoor air rather than pulling it inside your home. Shingles with high thermal emittance – up to 80 percent — include asphalt and composition. Thus, they are relatively energy efficient choices. Your roof’s solar reflective index is the degree to which it reflects the heat of the sun instead of absorbing it. Typically, roofing materials that are lighter in hue have a higher index than the same shingles in darker colors. Manufacturers in the roofing industry have developed high index reflective shingles designed to keep your home cooler during the hottest part of the year. Look for roofing that is certified by Energy Star for the best energy efficiency. These high-tech materials are available in a palette of colors that transcends the lighter shades of the spectrum. Energy Star certified shingles minimize the transfer of summer heat from your roof to the inside of your house. One way they do this is by maintaining a surface temperature that is up to 100 degrees cooler than traditional roofing materials. As a result, an Energy Star roof reduces your demand for air conditioning by up to to 15 percent during those peak periods when other homeowners are turning down their thermostats. You will see savings on your utility bills that compensate for the higher cost of highly efficient shingles. Cool roofs are composed of specially designed asphalt materials coated with a reflective, granular surface. This material redirects the heat of the sun away from your home to minimize heat transfer. Cool roofs are approximately four times more effective in shielding your home from solar heat than standard roofing fabrics. Also, their granular coating makes them less vulnerable to heat damage so they are more durable than their standard counterparts. Cool roofs reduce greenhouse gas emissions in two ways. First, by lowering your demand for air conditioning, they save electricity produced in coal-powered plants. These types of generating plants emit harmful greenhouse gases. Secondly, cool roofs last longer and reduce the demand for new manufacture of roofing materials, a process that also produces greenhouse gas emissions. Light-colored metal is another energy efficient roofing material with a significant solar reflective index. Clay tile roofs encourage airflow with their corrugated profiles. The air provides natural cooling that reduces your roof’s surface temperature and any thermal transfer into your interior spaces. Even if you are not ready to replace your existing roof with more energy efficient materials, you can increase its reflective index. Manufacturers have developed several coatings that make your roofing more reflective and minimize surface temperatures. Such protective coatings repel much of the heat that makes your home cooling system work overtime. Inside your home, adding attic insulation helps keep warm air inside during cold weather. If you add an attic fan to recirculate your air, you and your family can enjoy the full benefit of your heating system. A well-insulated attic also adds to the efficiency of reflective roofing too, adding a second heat shield to keep your home’s interior cooler. Be sure to use the type of insulation best suited to your climate and structural specifics. Your roof does more than just keep out the rain. It can save electricity and help your HVAC system work more efficiently. Whether you are replacing your roof or just looking for ways to save on your utility bills, look into the new high-tech products now available.